1. The latest album “The Symbolist” was released more than a year ago through Metal On Metal. Tell us a little bit about the whole process (composing, recording, production). - After finishing our “Nescience” album, an album that we have been working for 2 years, we tried to evolve our music style. We kept the same composing method but we added some thrash and prog elements. As a band we always depend on our theatricality, we try to create pictures with our songs so the lyrics are quite important when it comes to composing. We recorded again in our personal studio where we have the full control of everything. The result in my opinion is heavier than “Nescience” more diverse but it maintains our identity. 2. After 3 albums on this Italian label, what are your thoughts on this collaboration? - Metal on Metal Records believed and invested in us from the start and we are grateful for that. They are true heavy metal fans but also absolutely professional. 3. This record is a blend of different styles and influences, ranging from US Power to Doom Metal, from Progressive Metal to horror soundtracks. Some bands are referred in your press-release and the internet as your main influences and, I must say, those are the obvious names that come to mind first. But I would like you to expand on your musical influences and preferences. - We can say names all night. The key is that every member has different influences and background that all contribute in the final result. Lefteris is into soundtracks, very influenced by Danny Elfman, and US and Scandinavian power metal, Michail has more thrash references, Yiannis is a fan of traditional doom/death, and I am more in to progressive music with Neil Peart being my biggest influence in drumming and lyrics. In the end we have a blend that combines all the above in a way that we are all satisfied. 4. Would you like to highlight and explain some of the lyrics in “The Symbolist”? Is there a concept behind the lyrics of this album? I’m asking this because I don’t have access to the lyrics, but it seems to me that there is an overall feel to the album as a whole. As if we were listening to an epic saga and the images are running through our imagination. Perhaps it’s just how I’m reacting to the music itself and the theatrical vocals. - Well, yes and no. The songs have clearly a unity while speaking of different things. The songs have a strong anti-religion/nihilistic core. Speaking about the songs I wrote, I wanted to explore the conditions that lead human to create and worship gods, the continuous struggle to explain Reason and the relationship between man and authority of any kind. 5. After more than a year apart from the release, what’s the balance in terms of reactions from the press and fans? What about live shows? - Well, the reaction from the press was quite enthusiastic. We received only positive reviews and the fans showed that they enjoined “The Symbolist”. We also made our first video for the homonymous song and that helped us to expand our fanbase. We try to play live as much as we can, but the economic situation in Greece has effected all of us making it more difficult for us to invest the maximum in the band. But this year we played a couple of shows in Athens and Cyprus and now we focus on composing music and of course try to play anywhere we can. 6. What are your thoughts on the current Hard ‘N’ Heavy scene? Are there any new bands that you like or you just stay faithful to the old school stuff? - Personally I think that heavy metal is constantly evolving. There are bands mostly in the underground that play extraordinary music but they don’t have the chance to be heard by a larger audience. A band that blew my mind was Unexpect from Canada with their latest album. Also Diablo Swing Orchestra from Sweden with three great albums is a band that stands out. From the old school stuff I will always enjoy bands like Warlord, Crimson Glory, Jag Panzer and many more. 7. How’s the Hard ‘N’ Heavy scene nowadays in Greece? What bands would you like to highlight? - I have to be honest. 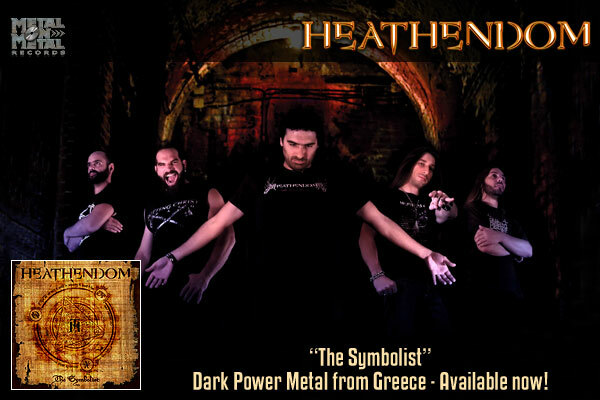 The scene in Greece has a tremendous versatility with bands playing all kinds of metal. But despite the fact that we have plenty of bands with quality, the fans aren’t very supportive. We have been in the situation playing with three other very good bands and there is an audience of fifty people, most of whom to be friends and relatives. To make some success here you have to be re-introduced after you make a buzz in the rest of the world. Obligatory army service and the fact that it applies here conscription for at least a year, is something that pulls back all the bands. These things have made all the domestic music products unattractive to companies that mostly believe that the Greek bands do not work enough or are not willing to sacrifice what needs to touring etc. And now we have and the economic crisis so you get the picture. Personally I distinguish Dustynation from Thessaloniki, Planet of Zeus from Athens, Innosense from Larisa, they all are great bands and I believe that at some point they will stand out. 8. One final question, music off-topic, and it concern the sign of times, since you’re from Greece and I’m from Portugal, both countries economy is totally ruined. What’s your take on what’s happening in Greece and the rest of Europe nowadays? - Very interesting question, since I deal a lot with political and economic developments. The situation in Greece is dramatic due to a wrong policy applied by the wrong people, driving more and more Greeks into poverty and strengthening extremist elements. I personally am in favor of the European Union provided that it operates with policies in favor to growth. But at this moment Germany is following the line of austerity, which is obvious who it actually serves. In Greece, the IMF seems to try to impose a program that is sure to fail in order to pressure Germany and the ECB to move into new haircut of debt, but unfortunately this will only burden us. They are trying to do something similar with Portugal. Of course the situation in Greece is burdened by years of corruption, the client regimes and social lethargy which led to a situation that can hardly be changed. The point is that if they do not find a quick political solution, the crisis will soon hit the French economy and then the game will end. I hope that there is light at the end of this tunnel and that we and you will still manage to overcome the crisis with as little sacrifice as possible. 9. Thanks a lot for your time. Do you want to leave a final message to the Portuguese Metal fans? - I thank you for the very interesting interview. First of all I would like to wish the Portuguese people to endure this difficult situation. Always listen to heavy metal and special thanks to those of you who liked our album and supported our band. The rest of you, give us a chance, I think we play good music that can satisfy fans of all kinds of metal. It would be great some day to play in Portugal. Hails to you all!! !